THIS strange rock with “alien symbols” could have come from a flying saucer that allegedly crashed in the New Mexico desert nearly 70 years ago, according to UFO conspiracy theorists. 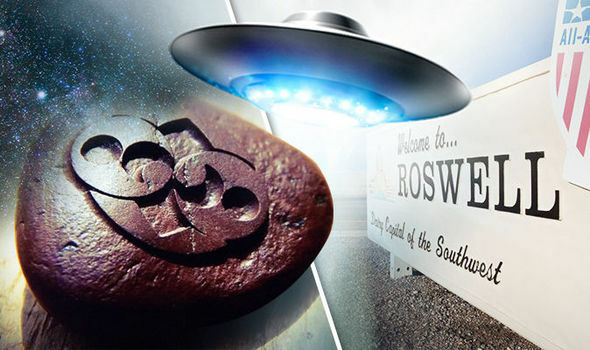 Known as the Roswell Rock, it is still being debated on websites as the potential smoking gun evidence in the world’s biggest unsolved UFO mystery. Roswell has been at the heart of UFO conspiracy theories since July 1947 when the military sensationally announced it had found the remains of a crashed flying saucer in the desert nearby. Witnesses later came forward to say there had been alien bodies within the “crashed craft”, which along with the wreckage were then taken to the mysterious top-secret Area 51 military base in Nevada. Roswell now holds an annual UFO festival because of its notoriety, and sightings are still taking place. The rock was actually found around 25 miles from the alleged crash site in 2004. According to believers, the rock has magnetic properties and markings etched into it that are similar to those found inside crop circles across the world. Debate about the origins of the rock were fuelled this week after it appeared in a new online video. Tyler Glockner, founder of YouTube channel Secureteam10 said in the short film: “It was discovered back in 2004, sticking out of the dirt in Roswell, New Mexico, in a basically barren, empty area of desert close to where the infamous Roswell crash occurred. “The rock was very smooth, rounded, and it contained these mysterious symbols that looked to show almost what looks like a lunar cycle of the Moon. “It’s been theorised that this rock may have been part of the wreckage from the Roswell crash. It is claimed that if magnets are placed near the stone it spins in circles, but this has not been filmed. Despite the ongoing debate about the rock, sceptics claim it is nothing more than a hoax, and the creator of it previously came forward. A post on a discussion about the rock on ufocon.blogspot.co.uk said: “That’s a several years old hoax, I think. If memory serves, an artist came forward and admitted making it. Even some well known Roswell researchers are not convinced the rock has anything to do with the alleged UFO crash. UFO researcher Kevin Randle said: “I suppose what we’re supposed to deduce here is that this rock had been in the spacecraft before the crash and that somehow it was ejected with no sign of the destruction of the craft, to be found, literally miles and miles from the crash site by a bow hunter. He said similar rocks had even been on sale at a UFO festival in Roswell in the 1990s. He added: “We can close another chapter on the Roswell UFO crash.